In April 2017, the SESAME Straits e-Navigation test bed project conducted a Sea Trial, which represented a successful conclusion to three years of collaborative effort between the Norwegian Coastal Administration, the Maritime and Port Authority of Singapore (MPA), Navtor, the University College of Southeast Norway, SINTEF Oceans, SimPlus, and Kongsberg. The objectives of the SESAME Straits project were very focused; to develop and validate shared situational awareness and cooperative decision making between the bridge team and shore operators. Secondary objectives: develop Just In Time arrival technology and use existing systems as far as possible. The project developed a straightforward concept of operations. A vessel sailing for Singapore would send its route to the MPA VTS. At the VTS, the route would be evaluated for hotspots and areas of likely congestion by using a Ship Traffic Simulator developed for this project. If hotspots were detected, that information would be sent back to the ship along with any proposed change to the route that the VTS might make. The bridge team would then evaluate the information and decide to adjust course or speed. Once the route was established, the ship would be given an arrival slot time and monitored to ensure it stayed within its slot. While the CONOPS were simple enough, several problems were immediately apparent. No existing ship systems could send a route to a VTS. No VTS systems in existence were able to receive a route from a ship, and no system existed for predicting congestion and hotspots in the Straits of Malacca and Singapore. And the VHF Data Exchange System to use for communication also did not exist. All of this technology was developed within the SESAME Straits project. In the month of March this year, the W.Wilhelmsen vessels MS Titania and MS Torino, each equipped with a prototype Kongsberg Maritime ECDIS, began sending their planned routes to the Kongsberg Norcontrol C-Scope SESAME system at the Singapore MPA VTS centre. There, the routes were evaluated for hot spots and areas of likely congestion, which were then sent to the bridge team. Communication was via a private, secure cloud solution from Kongsberg called K-Remote. The Sea Trial proved that this technology works at sea for sending and receiving routes, as well as decision support data. This same test was repeated in April, only this time using the VHF Data Exchange (VDES) prototype transponders developed by Kongsberg Seatex. VDES transponders were installed in the MPA VTS centre, as well as on the MPA Vessel Mata Ikan. Four distinct tests were conducted with VDES, and each was a success. We learned from these tests that VDES can be used to communicate a route from a ship, even in areas with heavy VHF traffic. SESAME Straits was a joint Singapore/Norway project under an R&D MoU, with the Research Council of Norway funding the Norwegian Partners. The project was owned and led by Kongsberg Norcontrol and endorsed by the Straits e-Navigation Alliance High Level Advisory Board, composed of the competent authorities of Singapore, Norway, Malaysia and Indonesia, and the organizations IMO, IHO, IALA, ICS, BIMCO, and CIRM. 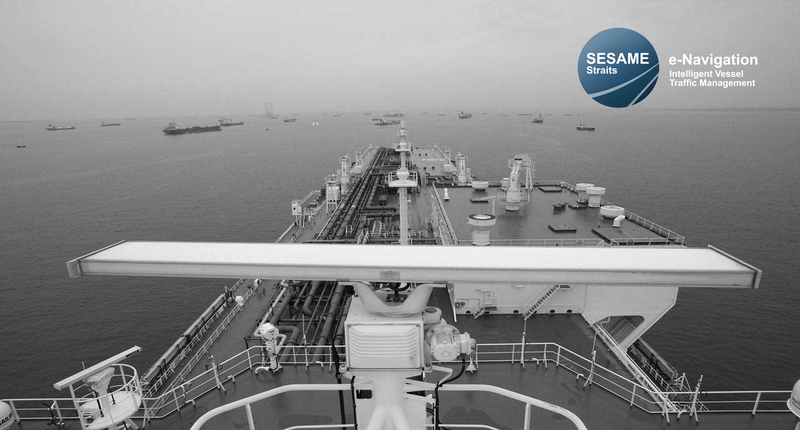 The SESAME Consortium is currently planning a follow-up project that seeks to extend e-Navigation services, expand the Just-in-Time arrival technology, and develop automated ship-to-shore reporting.